Giovanni Domenico (or, in French, Jean Dominique) Cassini was born on June 8, 1625 in Perinaldo (near Nice, now France). He studied mathematics and astronomy at the Jesuits and became professor of astronomy at Bologna, as well as fortress builder, at age 25. There, he determined the obliquity of the ecliptic at 23 deg 29' and studied the effects of refraction and the Solar parallax, worked on planetary theory and observed the comets of 1664 and 1668 (according to Kenneth Glyn Jones, also already one in 1652). Also, in 1663, he worked on fortifying the citadel of Urbino. In 1665, he determined the rotation periods of Jupiter (as 9h 56m) and Mars (24h 40m) with remarkable acuracy, by observing Jupiter's Great Red Spot, discovered by Robert Hooke (1635-1703) in 1664, and moving surface contours on Mars (such as Syrtis Major which Huygens had discovered in 1659), and was one of the first to observe the polar caps of Mars. He also observed the phases of Venus, and discovered the oblateness of Jupiter in 1665. 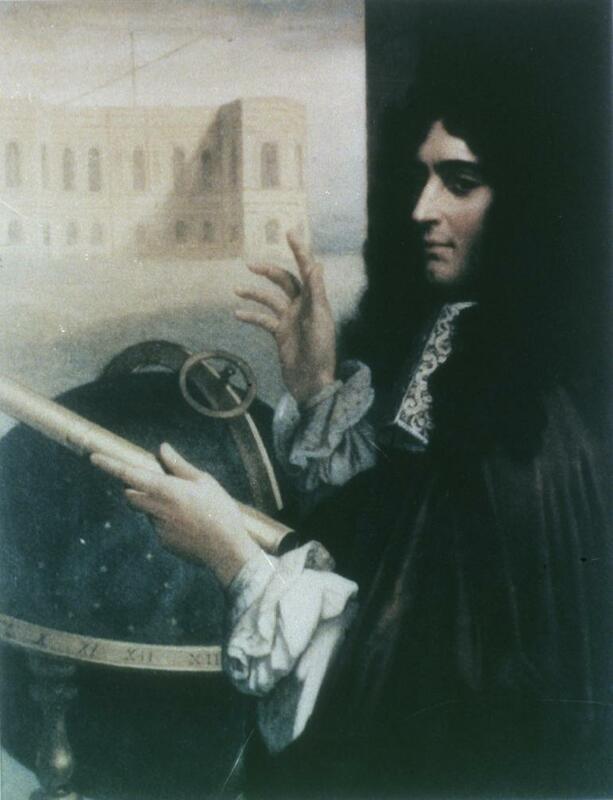 On invitation of the French King, Louis XIV, Cassini moved to Paris where he arrived on April 4, 1669, joined the newly founded Academie Royale des Sciences (Royal Academy of Sciences), and became the first director of the Paris Observatory. He used very long air telescopes, and collaborated with Christiaan Huygens in many astronomical projects. In 1673 became a naturalised Frenchman. In this year, he married a Frenchwoman. In France, Cassini observed more comets: those of 1672, 1677, 1698, 1699, two in 1702, and those of 1706 and 1707. In 1672, he measured the distance of Mars by triangulation with the help of observations of Jean Richer (1630-96); this enabled him to refine the dimensions of the Solar System, i.e. determine the value of the astronomical unit (AU). His value was just 7 % short. He created improved ephemeris for Jupiter's Galilean moons, and discovered the light-time effect, i.e. periodic delays of the occultations of Jupiter's moons compared to the times calculated. His coworker, Ole Roemer, used these results to calculate the velocity of light in 1675. He discovered Saturn's moons Iapetus (1671), Rhea (1672), Tethys (1684), and Dione (1684). In 1675, Cassini discovered that Saturn's rings are separated into two parts by a gap, which is now called Cassini Division in his honor; he (correctly) presumed that Saturn's rings were composed of myriads of small particles. In 1683, he independently discovered the zodiacal light, and correctly assumed that it was in effect of a cloud or aura of small particles surrounding the Sun. After 1683, he participated in geographic measurements led by Jean Picard, and in 1692 published a detailed Moon map. Cassini was the founder of a dynasty of four astronomers in Paris: His son Jaques Cassini (Cassini II, 1677-1756), his grandson César François Cassini (Cassini III, 1714-84) and his grand-grandson Jean Dominique Cassini (Cassini IV, 1748-1845) followed him as directors of the Paris Observatory. In 1711 Cassini got blind, and died on September 14, 1712 in Paris. His son Jacque Cassini succeeded him as the director of Paris Observatory. G.D. Cassini (or Cassini I) was multiply honored by the astronomical community, in some cases together with one of his descendants: Nasa/ESA's Cassini spacecraft to Saturn was named after him, as well as several lunar and planetary features: Moon Crater Cassini (40.2N, 4.6E, 56.0 km diameter, in 1935), Mars Crater Cassini (23.8N, 328.2W, 412.0 km diameter, in 1973), and Cassini Regio on Saturn's moon Iapetus (28.1S, 92.6W, in 1982). Asteroid (24101) Cassini was discovered by C.W. Juels at Fountain Hills observatory on November 9, 1999, and provisionally designated 1999 VA9; prediscovery observations had been 1926 XH, 1926 YB, 1986 RS16 and 1986 TM15. He is reported by his son, Jacques Cassini, to have discovered a "nebula" somewhen before 1711 in the area between Canis Major and Canis Minor and "which was one of the finest to be seen in the telescope". Messier was not able to verify this discovery, but it may be that Cassini had found M50 (according to Messier's list of unverified nebula discoveries). Kenneth Glyn Jones, 1991. Messier's Nebulae and Star Clusters. 2nd ed, Cambridge University Press, p. 316.